Once upon a time, I was a new blogger. I didn't know any better. I didn't know anything about coding, WordPress, blog posts, etc. I literally was the most clueless blogger. How I wish I had a book that had all the information I needed from getting started with blogging to creating a well-polished blog layout or theme and everything in between. For sure, my blogging journey would have been a lot easier and more fun if I had that information. Two years into blogging, I still have a ton of things to learn about blogging. 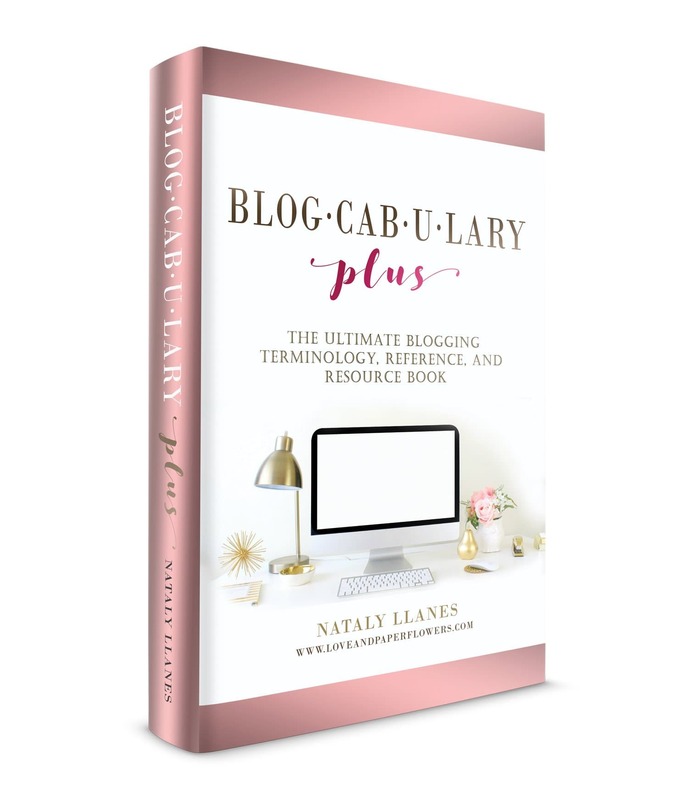 Just recently, my friend Nataly published a book entitled “Blogcabulary Plus: The Ultimate Blogging Terminology, Reference, and Resource Book.” I read the book from cover to cover and it's one of those books that I wish I knew before. It's very insightful and very detailed, something that new bloggers and even the more experienced ones will find useful. Frankly speaking, I spent hundreds of hours learning what I know now. Guess what? One can learn what I have learned over the past two years just by reading this book. I never like interviewing people, but I had to make an exception because I think there's a great value with Nataly's book. I'm so excited to share my interview with Nataly. Without any further ado, here's the interview. Click here to buy now ($34.00)! My name is Nataly and I am 33 years old. I am a wife, a mom of two little ones, a registered nurse, and a blogger. However, I wasn’t always a blogger. After our second child was born priorities shifted and my husband and I decided I would stay home for a while looking over our new growing family. It was a huge adjustment, to say the least. But between laughter and tears, I found ways to make it work as a new “stay-at-home mom”. I knew I was extremely blessed to have had the opportunity to be able to stay at home with my children. But there was still a professional and creative void I couldn’t ignore and as a career-oriented woman, financially contributing to our family nucleus was very important to me. I then started looking for ways to make money from home and contribute financially- and that’s when I found blogging! 2. Can you tell me about your blog and your blogging journey so far? I started my blog almost a year and a half ago after my second child was born. I had researched ways that I could make money at home with a flexible schedule and blogging fit that bill. The initial intent of my blog was to showcase DIY projects, offer parenting advice along with words of love and encouragement- hence my blog’s name “Love and Paper Flowers”. But as I learned more about blogging itself and its processes I became obsessed with applying those techniques and implementing new ones that could help me reach my financial goals faster. After applying such techniques and seeing the incredible results unravel before my eyes I knew I had to share it with others. That’s when my blog’s purpose changed entirely to empowering other people (especially women) find their own voice through profitable blogging and social media strategies. With that said, success didn’t come easy. There were a lot of late nights, research, trial and error, and sacrifice that went (and it is still going) into every step of my blogging journey. 3. I've been blogging for two years now and I still learned a lot from your book. What was your reason for creating Blogcabulary Plus: The Ultimate Blogging Terminology, Reference, and Resource Book? When I first started blogging my biggest struggle was learning and understanding terminology and its processes. Coming from a “non-techie” background many new terms and process were foreign to me. I spent countless of hours searching information on my own because there wasn’t a comprehensive resource at the time that offered all that information in a nutshell- and that’s when it hit me! I took it upon myself a few months ago to compile ALL of the blogging terminology (340+ terms to be exact). Not just terminology, but its counterparts, concepts, and process that bloggers were in need of learning. 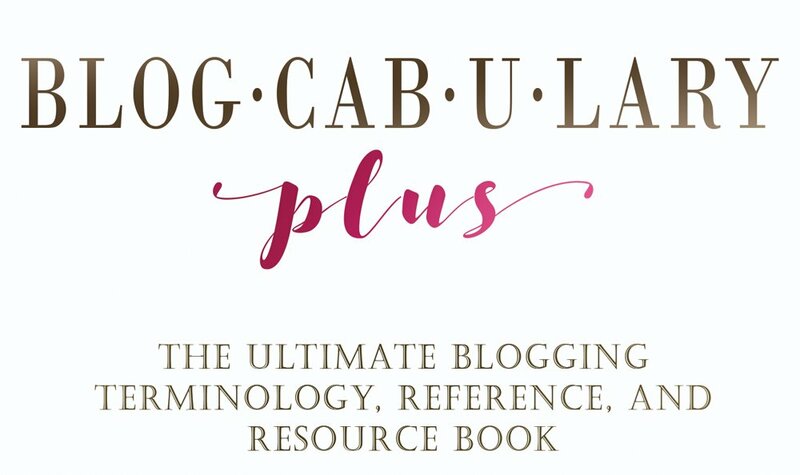 That’s where Blogcabulary Plus: The Ultimate Blogging Terminology, Reference, and Resource Book was born. 4. What do you think have been the biggest challenges for people with blogs or just starting out with blogging? I feel that most who start a blog (myself included) often think that finding a host and downloading WordPress will be the most intricate process of their blogging journey. And boy, are they wrong! For those who will take on blogging as a hobby, that might be true. However, if you would like to run a profitable and successful blog, other areas of blogging quickly become crucial to understand and practice. 5. Is there such thing about blogging terminology? Well, the truth is… blogging terminology isn’t just about blogging. Successful and profitable blogging consists of a collection of terms that go far beyond blogging itself. 6. Is your book just about blogging terminology? No. Blogcabulary Plus isn’t a blogging “dictionary” with alphabetical words that have no correlation to one another. Not having to worry about the massive research and overwhelm that comes with blogging gives you the ability to do what you set out to do in the first place… Write, create, and make a profit! 7. What's the one thing you wish you knew a long time ago about blogging? There is so much to learn and with other day-to-day responsibilities is so hard to find a good balance sometimes. I wish I would have known that investing in the right learning material wouldn’t have been an expense, but an investment. I opted out of a few eBooks and eCourses early in my blogging journey because I felt I could learn that on my own. In turn, that decision held me back from making a profit sooner. I wish I would have known the importance of learning affiliate marketing early on. I wish I knew early on not to compare my blogging journey with others, especially those who have been doing it longer. Often times, through my trials and errors that comparison made me doubt about my own success and hard work. … And finally, I wish I knew early on that profitable blogging existed and that it was possible for anyone who really wanted to pursue full-force and reach financial independence. 8. It seems that more and more people are starting to create their blogs, what do you think should bloggers focus on with their blogs? I am ecstatic that more people are realizing that technology and its counterparts are taking over the workforce. Furthermore, profitable blogging is one of the few businesses I know that will gives you the ability to potentially make a significant amount of money with a small initial investment and the comfort of your home. I think that focusing your time on those tasks that brings you the most income should be a priority. You have to take a look at your individual business and see what you can offer others that will be profitable. Sometimes this takes trial and error, and putting some theories into practice. Whether that is affiliate marketing, displaying ads, selling electronic products, physical products, offering services… decide what to focus on and build on that so that it can bring you biggest possible return. Once you have one process down and able to set it on autopilot, tackle another aspect of profitable blogging. And that is the true essence of most successful bloggers- using multiple trickles of income stream to contribute to a more robust income. But, making sure to work on one at a time so that each layer of foundation you put down can sustain itself and not crumble. 9. You discussed everything there is about blogging in your book, what do you think are the key points that readers will find the most value? Well, I think everything in the book is important and all concepts work in tandem with one other. It also depends on what the reader might be the most interested in. I feel that the affiliate marketing, email marketing, social media, and understanding SEO are the biggest elements of the book. 10. 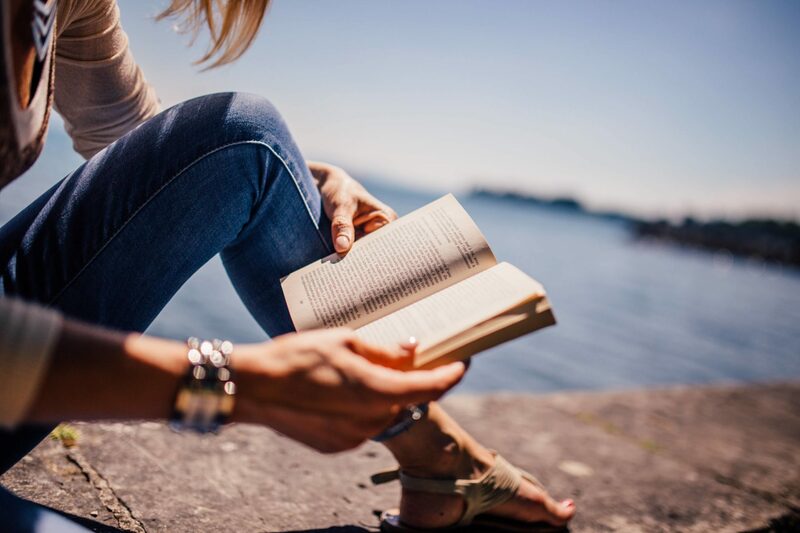 Is your book just for beginners? Not at all. As you mentioned earlier, you have been blogging for two years and there was information in the book you didn’t know. Although the book is designed to walk someone step-by-step through the very first process of the blogging journey, that doesn’t mean that an intermediate blogger might not find valuable content. In fact, chances are that coding and SEO are still areas of blogging that even veteran bloggers still have trouble with. Blogging is a journey, not a destination. When you meet a goal, you set another and you continue growing and learning. A successful blog doesn’t happen overnight. It takes patience (and a lot of it), perseverance, and determination. But know that with the right tools and resources you can speed up the rate of return and overall blogging income. Use your mistakes to reinvest your ideas and your successes to recreate your actions. Take it from me, you can do it! And if you believe it, you will. The best of luck on your journey my friend. …and thank you Allan for the honor of this interview.